What’s noticeable in this video is the under-painting of the sky with green. Its such a strong colour, when used for foliage in a landscape painting, the sky will always look detached if there is no crossover of colours between sky and ground. This is most important when a ‘tube’ green is in use, as opposed to green from a yellow and blue mix. The addition of green to the sky colour mixes would be hard to control, too much or too little can happen when mixing on the palette. With a layer of green in place, I just continue to paint the sky knowing that there will be a tinge of green in all colours added to the canvas, especially after the colours are blended together. Here is the video. There is more info on this painting in the previous post. 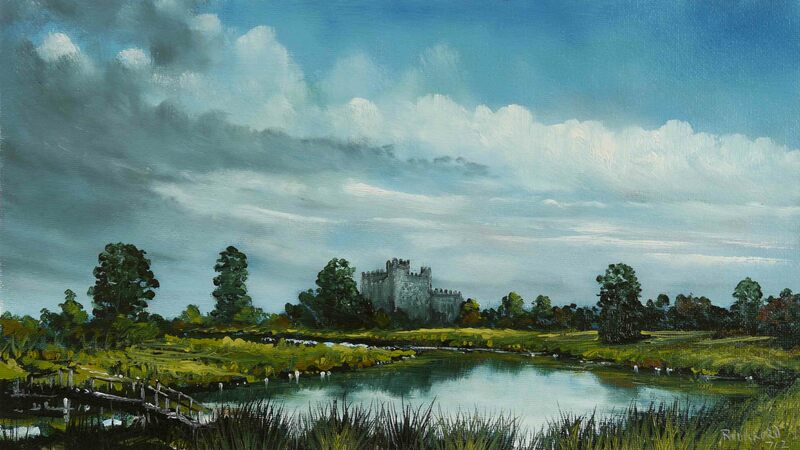 This entry was posted in Oil Painting and tagged Art, Culture, Education, Inspiration, Irish landscape, Oil Painting, Oil Painting Instruction, Oil Painting Landscape, painting, Pictures, Sky, Time lapse painting, Water. Bookmark the permalink.